Own The Dollar — Own the dollar….don’t let the dollar own you. Dealing with a broken-down vehicle is difficult to say the least. Not only are you without transportation, but you also have to figure out which repairs are vital and if the shop’s quote is reasonable. While your first priority may be to get your car fixed asap, the worry that you’re overpaying could be enough to drive you off the deep end. 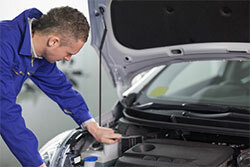 Many people prefer to have their car serviced and repaired at a certified dealership. This is great, except for one problem. Dealerships overcharge their customers. Right? Fortunately, there are several steps you can take to ensure you are not being overcharged at the dealership, and that the dealer is truly doing what they say. Don’t take the dealer’s world for it. Instead, ask them to show you the problem they claim exists. Even if you don’t understand what you are looking at, you can learn more about the problem at hand, which will help you better understand your bill as well as any future issues. Recently, I needed to have my back brakes replaced as one of the pads was “hanging up.” I never heard of this before and was a bit skeptical, so I asked the service manager to show me what he was talking about. Sure enough, the pad was hung up and wearing unevenly. In this instance, I was being told the truth. But how did I know for sure until I saw it myself? Your dealer is going to charge you for both parts and labor. Before you agree to the repair, ask to see an itemized invoice that shows the labor rate as well as the cost of the parts. Pay special attention to how much the parts cost, as this can differ substantially from one dealer and mechanic shop to the next. If you get the feeling, or know, that this cost is higher than it would be elsewhere, tell the dealer to hold off for a bit while you move forward with the steps below. Dealer service departments are not the end-all when it comes to car repairs. There may not be as many third part mechanic shops as there used to be, but these do exist in most parts of the country. If your car is drivable, take it to a mechanic that you trust (or one that has been referred to you). Even if you cannot drive it, you can always call the mechanic on the phone to explain your situation and the quote you received. There are five Honda dealerships in my local area. I could take my Accord to any one of them for service. While you might expect them to all charge the same, this is actually not the case. Did you know that the service department works independently from the sales side of the business? Just as salesmen are doing their best to make money, the service department is doing the same. Before you sign on the dotted line and the repair process begins, call at least one other dealer in the area – of the same manufacturer – and ask what their costs would be for a similar job. Since you already have the itemized breakdown, you can tell them exactly what you need. I am the type of person who would rather go to a dealer for repairs than a third-party mechanic. That being said, I am always careful about what I pay for. It is a myth that the dealer always overcharges for service and repairs. But it does happen all the time. By following the above advice, you can avoid the many issues that have plagued thousands of people before you.